It wasn't the ideal holiday for a writer who requires copious amounts of solitude and space. Time: two months. Mode of Transport: Fleetwood Tioga Recreational Vehicle, 29', no pop-outs. Companions: one husband, two sons, and two labradors (both male). The testosterone level was high, high, high, and the space was small, small, small. But as we drove through 25 of the United States, visited nine national parks, hiked, biked, and tasted small town hospitality, I began to see that the trip was the perfect gift for a zero-gen American like me. From sea to shining sea, the splendor of this land (is my land) was ... overwhelming. I felt much like I did when I walked into that Flushing, Queens library for the first time years ago and saw shelves of books waiting for me: "All this, for me?" Correct answer: "For us, beloved, so borrow, enjoy, but leave no trace." It's good to be back on the Fire Escape. 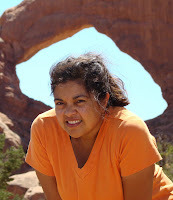 Photo: Arches National Park, Utah.